Hastings in East Sussex is one of the medieval Cinque Ports. It has the largest beach-launched fishing fleet in Europe. We call the beach here the Stade which is a Saxon term meaning landing place. The town is most famous for 1066 – the Castle was built by William the Conqueror. Its ruins are at the top of the West Hill which offers wonderful views of the Channel. The steepest funicular railway in Britain takes passengers from the Old Town up the hill to the Castle. Hastings Old Town is a must for all visitors. There are ancient churches and lots of passages and narrow streets (twittens) to explore. One of the oldest buildings, the Court House, which stands at the southern end of The Bourne, was built around 1450. Some of the best streets to visit in the Old Town are George Street, High Street and All Saints Street. Steeped in history these streets are also great for shopping, restaurants and bars. In the High Street is Shirley Leaf and Petal Company. It is a working museum that uses antique tools and machinery to supply artificial flameproof leaves and petals. There are more than 1,000 cutting tools and flower irons making it the largest working set of flower and leaf making tools of its kind in Europe. The business is a specialist supplier of leaves and petals to the film, television and theatre industry. Their creations have been commissioned and used in films such as Gladiator, Reign of Fire and the Kingdom of Heaven. The English National Opera, the Metropolitan Opera House in New York and Andrew Lloyd Webber’s productions use their products. 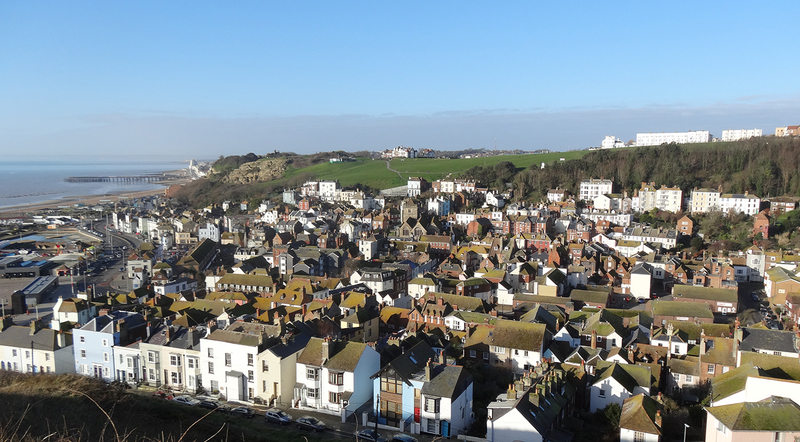 There are three museums in Hastings; the Hastings Museum and Art Gallery, the Hastings Fishermen’s Museum and the Shipwreck Museum. The Jerwood Gallery is the home for the Jerwood Collection of 20th and 21st century art. Hastings also has three 18 Hole Miniature Golf Courses, where the World Crazy Golf Championships happen every year. Famous residents and visitors include Charles Dickens, Beatrix Potter, Lewis Carroll, Dante Gabriel Rossetti and Catherine Cookson. Also the Old Town and beach are locations in the popular television series ‘Foyle’s War’. The Source skatepark on the seafront is the largest submarine skatepark in Europe. Offering visitors a cafe and local art in the spectators gallery. Recently the town celebrated the opening of The Peoples Pier, rebuilt following a fire in 2010. The beautiful Marina Beach St Leonards and Pelham Beach received awards from Keep Britain Tidy. Marina Beach achieved the coveted international Blue Flag award.